"This lyrical, aesthetically satisfying concert will present music that sears your heart and mind and lifts your spirit." Performers include Wikkie Vis (cello, guest artist from the Netherlands), Sharon Yearsley (soprano), Natalia Mann (harp), Jonathon Berkahn (piano), Justus Rozemond (clarinet), Rachelle Eastwood (flute), Josiah Young (sax). The programme includes works by Carlos Micháns, Jack Body, Lyell Cresswell, Natalia Mann, Douglas Lilburn, Armando Ghidoni, Eve de Castro-Robinson, Johannes Brahms, Alphons Diepenbrock, Julius Röntgen, Jean Françaix and Armando Ghidoni. 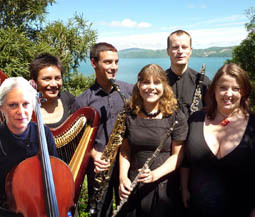 This concert is the first in a series of six concerts managed by the "Caprice Arts Trust":http;//www.capricearts.org.nz. E-tickets and further information, including venue maps, available from the Caprice Arts Trust website.